2. It is PERFECT for busy schedules. Just let it do all the work for you. 3. It makes your house smell amazing all day long! My life has slowly be transitioning into the “taxi parent” phase of life. Between school, sports, dance, appointments, you name it- sometimes I feel like I should just set up camp in my van. Some days, it seems I spend more hours in my van than anywhere else haha! This is one reason my slow cooker has been my best friend this school year. 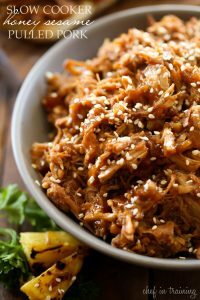 This recipe was inspired by this Slow Cooker Honey Sesame Chicken, but has more of a little hawaiian flare to it. The end result was tender, delicious pork that is perfect in between a bun with some grilled pineapple or really however you want to use it! If you need a quick, easy, yummy dinner, give this one a try! This meal is SO delicious, easy and PERFECT for a busy day! Spray slow cooker with cooking spray and place roast in the bottom. In a small bowl combine diced onion, garlic, honey, ketchup, soy sauce, brown sugar, sesame seeds, pineapple and red pepper flakes. Mix well and pour over the roast. Cook on LOW for about eight hours until pork is completely cooked through. Remove roast and place in a large bowl. Mix cornstarch and water together in a small bowl and slowly pour into the liquid remaining in the slow cooker. Stir until it is well incorporated and cover with the lid. With two forks pull the pork until it is all shredded. Return meat to the slow cooker and stir in with the sauce. You can serve this over rice or in a sandwhich with a slice of grilled pineapple. I've been looking for a good pulled pork recipe. What type/cut of pork roast do you use? Now doesn't this look amazing?! I'm making this today. Just realized the recipe says 6-8 hours on high...is that right? Usually these type recipes are 4-6 hours on high or 7-10 on low. Double checking...thanks! This was delicious! I don't like pineapple, so I used slices instead of chunks and pulled them out before serving. I did use all the pineapple juice. The flavor of the sauce is great and there was enough to drizzle over veggies. Will make again! A hit with a everyone in my family. Making this now. I tried the mixture before I pour it in, and it tasted amazing! I doubled the recipe and it was perfect. I had to add a bit more than double the corn starch to get the sauce really thick, but that's just a minor thing. I have already made this twice and will continue to do so for years to come. Thanks for this!